The build up for the Boxing Day runners took on a festive theme. 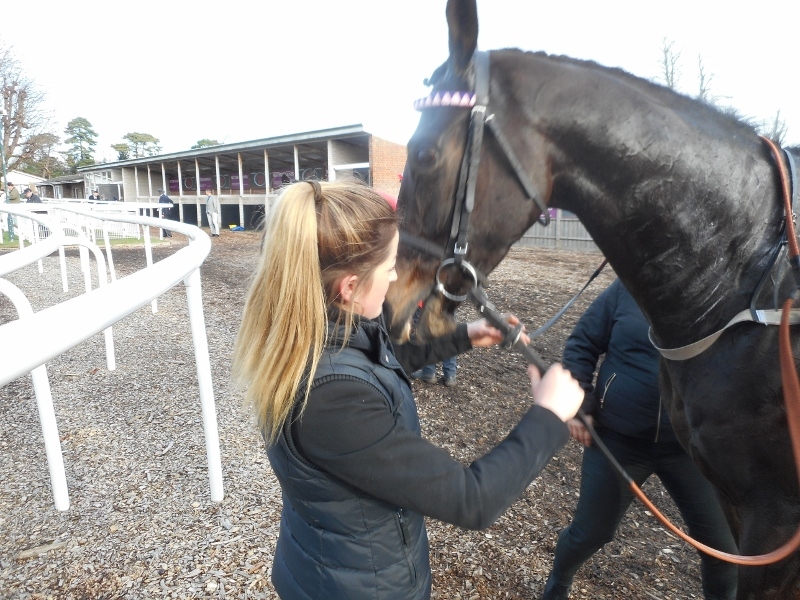 However unconventional, it worked a treat with both horses winning the "Best Turned Out" award, £25 for Katie and Mab Dab and £25 for Alex and Itoldyou, though neither of them appeared in tinsel on the course. 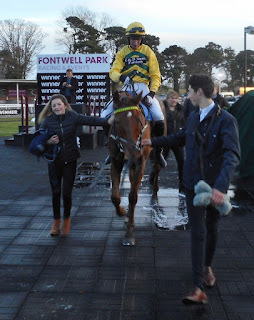 It had an even better effect on Itoldyou as he finished a very competitive 3 and a quarter mile chase in second place. He was one of 12 who went to post and Tommy Dowling had him in 4th to 6th position for the first couple of circuits. 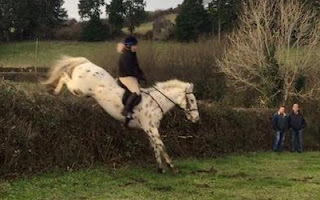 He jumped well. He was one of three who pulled clear of the pack going out on the final circuit and a great jump at the fourth last saw him take the lead. He stumbled a bit on landing at the second last but kept on going, still leading over the last. However one of the pack had made steady progress up the home straight and joined him just after the last. They had a great battle to the line with Itoldyou finally being beaten into second place by half a length but well clear of the third placed horse. Alex and Katie lead Itoldyou in. 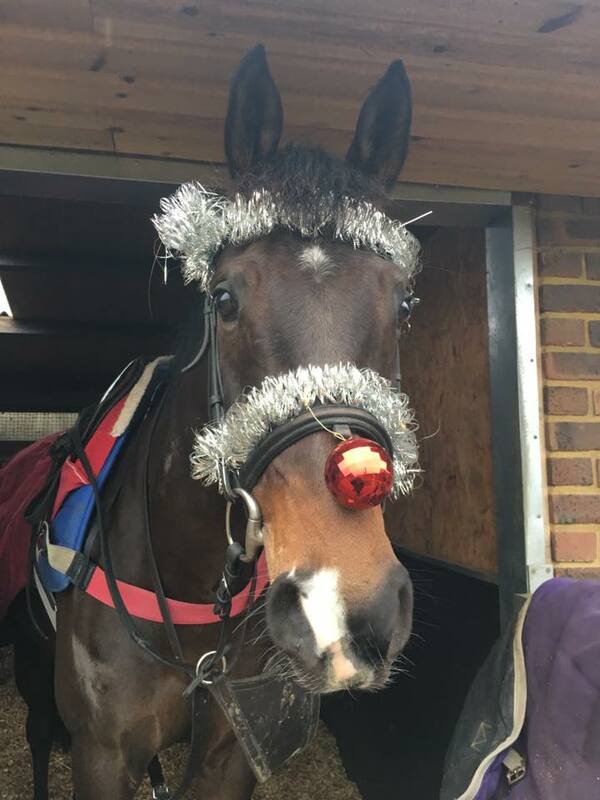 The lead up to Christmas is all go!!! 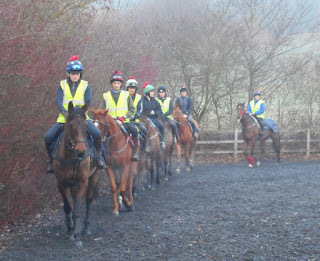 The days may be shorter but there has been no let up in activity at the stable as we approach Christmas. Earlier in the week the staff enjoyed their Christmas party at the local golf club. The photograph below is, I understand, one of the few for public display! Whatever, it was a great evening, an excellent team bonding session and a boost for all in this gloomy weather. On Friday Linda, Karen and several of "the girls" went to the Olympia Horse Show. 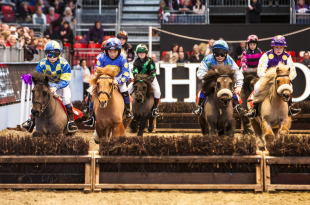 They all had a great time and especially enjoyed the "Flat" versus "Jump" jockeys competition and the Shetland Pony Grand National. 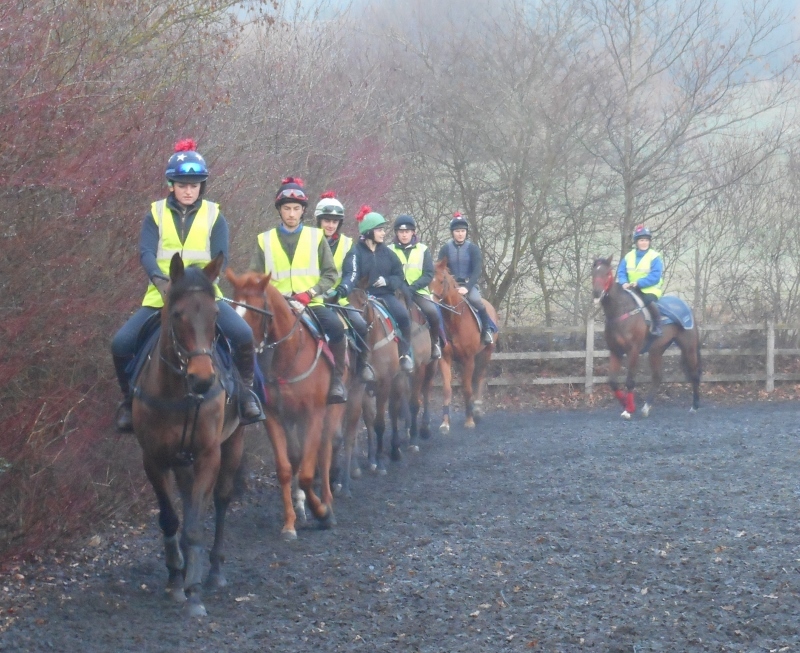 Today the first lot was larger than usual with a guest appearance from Tom Copeland who was a rider here several years ago. He was allowed the privilege of riding the now retired Red Anchor. 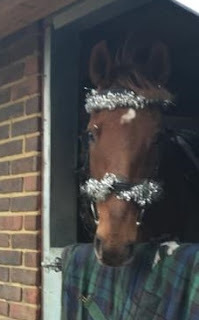 Entering into the festive spirit the riders added a little tinsel to their helmets. Breakfast was also livened up with a glass or two of Prosecco to celebrate the naming of two horses, Jolly Jet and Pippa The Dancer. We wish all the followers of this blog a very Happy Christmas and a successful 2017. 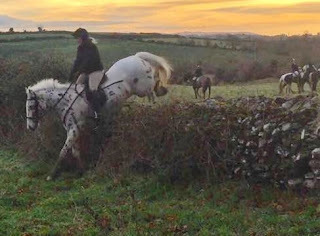 When workers at the stable want a short break what do they do? They go out riding horses of course. Karen, accompanied by Ben, and James went to Ireland at the weekend for a spot of hunting. 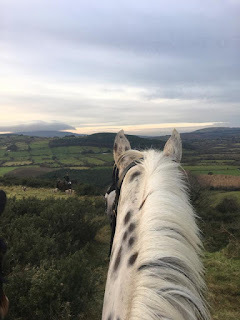 And not only was the riding thrilling, but the views were stunning too.